How can the church be aware of its assumptions and plan for its future? 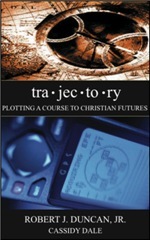 Based on his work with Cassidy Dale, Dr. Robert Duncan has written an engaging book entitled Trajectory: Plotting a course to Christian futures. Now Duncan has gathered the first of several Leadership Summits on this field, to help denominational leaders, pastors and DMin students grapple with the stages and common stumbling blocks ministers and churches face as they move into the future. In thinking about this subject, I have turned to the Parable of the Dishonest Manager, Luke 16:1-15. Note that the Devious Manager did not arrive at his future through forecasting the harvest, nor through team visioning, nor through Estate planning. Instead the Manager won the lottery equivalent of his day through shrewdness-through “just in time” learning, which led to social networking and wealth of relationships. The dictionary defines foresight in a secondary sense as taking provision, prudence, making preparations for tomorrow. I find it interesting the Manager took no thought of the future, whether his or others, until he was caught in scandal. Another way to say this in today’s vernacular is this: if life gives you lemons, make lemonade! Maybe in all our praise for the Good Samaritan, we have overlooked the foresight of the Dishonest Manager! We dare not cast authenticity, integrity, or ethics to the wind, but in terms of anticipatory leadership, Jesus’ wily anti-hero may be a biblical archetype for our time. We should not be dismayed by leadership scandals, natural disasters, broken government, financial meltdowns, or even personal tragedy, because God is all and in all. The calling for our time is to move from leadership failure to foresight. The future according to Jesus shows us the creative path. The realm of first things lets us explore the divine limits of human possibility. The call to be missional, rather than provincial, challenges us to be engaged in all walks of life. Yes, let us avoid the ethics of the Dishonest Manager, but let us emulate how he responded to disaster. Let us approach the future in faith to make all things new. Like the shrewd manager, Bacone is using everything in its power to redefine the playing field for emerging native Americans, and equip them for 21st century vocations. The church needs to reframe its role in missional ways, to empower the development of whole regions, whether economic, workforce, and community development. The trajectory that Bacone is taking in this is encouraging in becoming a learning organization for the 21st century. If you live in Oklahoma or in neighboring states, I encourage you to get on their conference mailing list. I have posted my full talk on Framing Christian Futures in the member area of ChristianFutures.com. Consider joining our network today. You’ll get access to our web resources, interact with us to develop a personal mentoring plan to develop your futures fluency and skills as an anticipatory leader.